Beginning Sunday, November 13, through Saturday, November 19, Best Buy Mobile will be offering customers a deal on the Samsung Galaxy S II Epic 4G Touch. Anyone who purchases this Sprint phone with a 2-year contract will receive a Samsung BD-D5100 Blu-ray player for free. This really isn't a bad deal for anyone who was considering picking up the Epic 4G Touch on Sprint. While there's always a "new" and "better" phone coming out, the Galaxy S II series is undoubtedly this yearss smartphone winner. Not only did Samsung sell 10 million of them in 5 months, but they also recieved top honors at the 4G World Expo (The Epic 4G Touch won top spot). A 4.52" Super AMOLED(TM) Plus touch screen delivering brilliant colors with the most contrast, providing a vivid and crisp viewing experience. Playable formats: Blu-ray, MPEG-2, MPEG-4, DivX, DivX HD, WMV, WMA, MP3 and JPEG with built-in 256MB flash memory and HDMI port. Access to video content from Best Buy CinemaNow® Netflix®, and YouTube®. Dolby Digital, Dolby Digital Plus and Dolby Digital TrueHD decoders. Greatly enhanced video performance of standard DVDs by upconverting their video resolution to HDTV-compliant resolutions via the HDMI interface. Use the Epic 4G Touch as a smart remote for Blu-ray player. Use the AllShare® feature to send photos and videos from the Epic 4G Touch wirelessly to your TV via Blu-ray player over your home network. That means you'll be getting the "phone of the year," and a complimentary Samsung BD-D5100 Blu-ray player, all for the price of $199.99 (with a 2-year activation). Considering the retail value of the Blue-ray player is $89.99, it's like getting the Epic 4G Touch for $110 --- that's a great price for the phone that catapulted Samsung to the top of the mobile manufacturer list. If this deal interests you, remember it will only be valid Sunday, November 13, through Saturday, November 19, at Best Buy Mobile. For those of you not interested, worry not, many more deals to come. 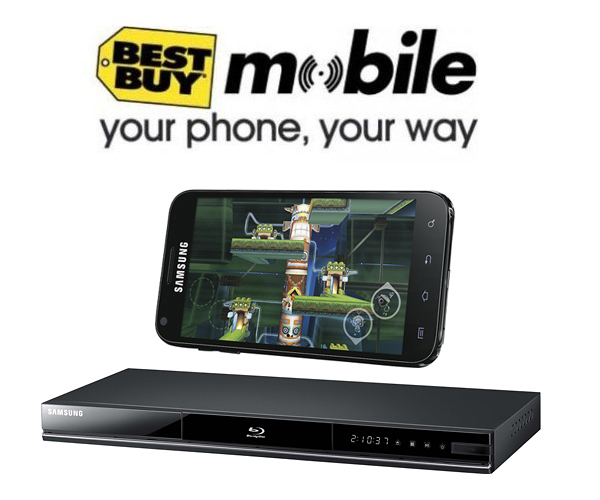 Purchase a Galaxy S II Epic 4G Touch with a Sprint 2-year contract from Best Buy Mobile and get a free Blu-ray player [Deal Alert] originally appeared on AndroidGuys.